Worth reading to get more insight on the recent suicide of a brilliant young man. 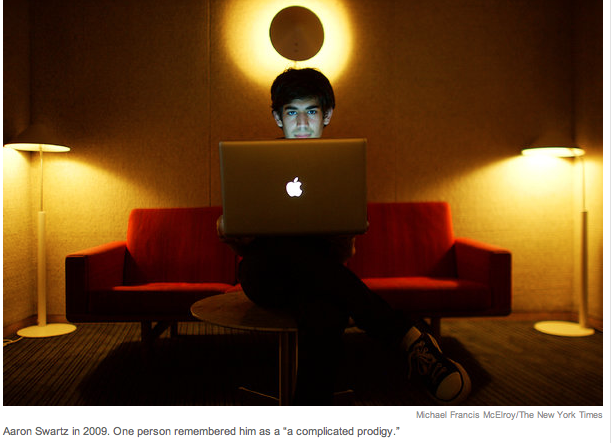 The Truth about Aaron Swartz’s “Crime”. We’re discussing how this reflects on copyright issues in my Social Media class forum at Drury University. More to come on that front. My thoughts are mixed, since I am a writer, photographer and visual artist. I want artist’s intellectual property to support us to do our creative work, but I also believe in free access to information. What are your thoughts? Mine are ambiguous – how do creatives support themselves in an open access free information system with no copyright protections? Categories: The Social Media Frontier | Tags: aaron swartz, copyright issues, Drury University, free access to information, photographer, Social Media, truth about Aaron Swartz crime, visual artist, writer | Permalink. Storyteller, myth maker, visual artist, intuitive dancer, meditator, chanter, yogini, spiritual devotee, incurable romantic, music lover. Communications professional, writer, photographer, nature lover, environmentalist, social media professional.